14th February 1919: The initial draft of the Covenant of the League of Nations comprising of 26 articles was completed and published under the close supervision of US President Woodrow Wilson. However while the League was accepted by many nations the US Congress refused to accept American membership of the League. 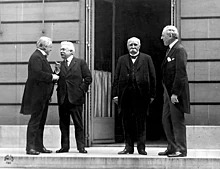 18th January 1919: The start of the Paris peace negotiations. To the surprise of many in Germany, given that their armies were still on foreign land, the Germans were not given a fair place at the table. On the other hand the Allies were deeply divided on their aims, with the French wanting to cripple Germany for centuries, but President Woodrow Wilson’s American delegation wanting a League of Nations (although the American people were much less keen on the idea). Although there were 32 countries and nationalities represented, events were dominated by the small group of the major nations which became known as the ‘Big Four’, France, Britain, US, and Italy (photograph above right).